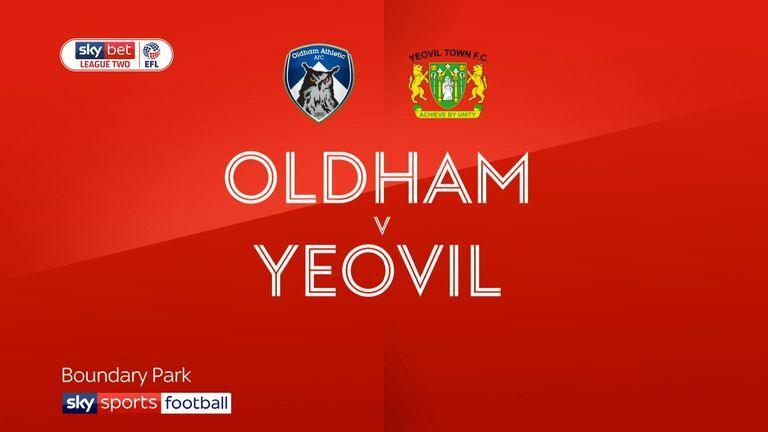 A 4-1 win for Oldham against Yeovil means Paul Scholes passed the first test of his managerial career in fine style, but it will take some time before he is able to cut the team into his own image, writes Sky Sports News reporter Ben Ransom. The occasion certainly lived up to its billing. 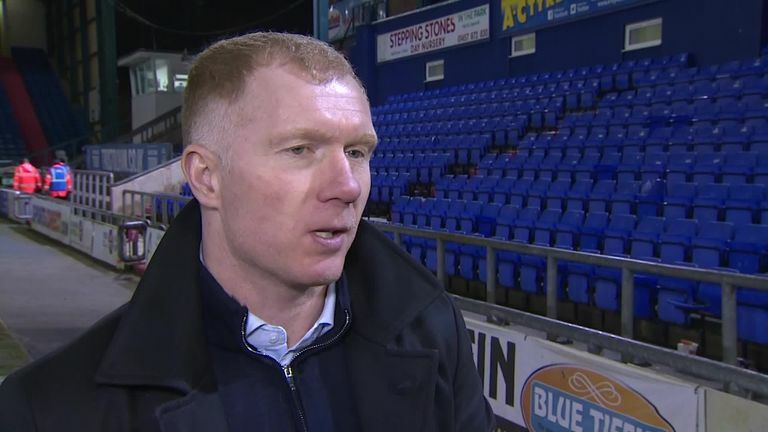 Back at the club he watched as a boy, Scholes was given a standing ovation when he was introduced to the Boundary Park crowd before his first game in charge. Ninety minutes (plus injury time) later, he left the pitch to even louder cheers after his side had scored four well-crafted goals to move up to 11th in League Two. Scholes the player would have been proud of three of the four strikes - all excellent finishes from players moving on to the ball and striking home with conviction. Even Callum Lang's header which put Oldham 2-0 up early in the second half bore a similarity to a goal Scholes nodded home to win a Manchester derby for United at the Etihad Stadium. Oldham has been a club reinvigorated this week, with the spotlight firmly on the multiple Champions League and Premier League winner. When he finally emerged from the tunnel around 45 minutes before kick-off, Scholes was greeted by a bank of cameras. His outfit choice showed a man still coming to terms with his new job. It was a mixture of modern manager and studio pundit - suit trousers and shirt, combined with a dark blue jumper and a pair of brown suede shoes. During my pre-match live on Sky Sports News, I described the look as being more Pep Guardiola than Sir Alex Ferguson - largely because of the knitwear. Scholes the player was also evident in that period before kick-off. Standing out on the pitch with his staff, he almost immediately started rolling a ball around with his feet. It started to rain, but rather than wander back to the dugout for a coat, he was happy to get wet and keep playing with the ball. Having played more than 700 matches for Manchester United - and about to manage his first - you could forgive him for slipping back into the comfort zone of player rather than manager. For the start of the game, Scholes adopted a position right on the edge of his technical area, as close to being on the pitch as he could be. His Oldham team adopted a similar stance - playing on the front foot and trying to get the ball forward quickly. There was an early test on just 11 minutes when defender Tom Hamer had to go off with a back injury after suffering a really nasty fall. Scholes wasn't flustered by having to make an early change, and his team followed his lead by continuing to set the tempo. Jose Baxter's opener in first-half stoppage time was reward for their efforts. But alongside the good, there were also telling glimpses into the very real challenges Scholes will have to deal with dropping into League Two. He had obviously tried to work on set pieces during his one and only training session with the squad this week. Midway through the opening period, Oldham had a corner on their right, and they came up with a routine I can honestly say I've never seen before. Five attacking players all stood in a group on the right-hand corner of the penalty box (closest to the taker) before peeling away to all parts of the area. However, the ball was instead played short to Johan Branger-Engone, who cut inside himself and fired in the shot. The ball didn't only clear the bar, but also the stand, only the very top of the roof preventing it from being an early casualty of the new regime. Scholes turned away in frustration, shaking his head and kicking the floor. It was only a moment, but an indicator nonetheless of how difficult it might be for League Two players to implement Premier League ideas. The Oldham fans won't care if some of his more adventurous ideas don't come off, as long as Scholes continues to lift the mood and the performances of the team after years of gradual decline. The noise level raised steadily with every home goal that was scored, especially when late strikes from Mohamed Maouche and Christopher Missilou ended any hope of a Yeovil fightback. On 89 minutes, with the score at 4-1, the chorus of "Paul Scholes' Blue and White Army" rang out around Boundary Park for the first time. Scholes has always naturally shied away from being the centre of attention, so perhaps understandable that after his first night under the microscope as a manager, he disappeared quickly down the tunnel at full time happy to let everyone else at the club celebrate his first win in charge. An understated exit maybe, but Oldham's new look is already starting to turn heads.